Teriyaki Beef Skewers are an easy to make grilled appetizer or entree. Tender pieces of sirloin steak marinated in an Asian inspired sauce and cooked on a hot grill until lightly charred. Each beef skewer is drizzled with a sweet and savory teriyaki sauce and garnished with sesame seeds, green onion, and cilantro. Hi there! 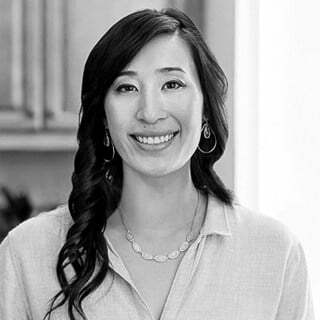 It’s Jessica Gavin, Certified Culinary Scientist and I’m thrilled to share this teriyaki beef skewers recipe with you. I used my go-to teriyaki marinade which doubled as a sauce to serve alongside these tasty skewers. The sauce can be served with other recipes like chicken teriyaki or crispy baked tofu. It’s one of my condiments from the elevated add-on chapter of my new cookbook. These grilled beef skewers are easy to prepare and perfect to serve to a hungry crowd as a tasty appetizer or with side dishes for a hearty entree. When selecting beef for grilling, it’s a balance between flavor, tenderness, and price. Since the meat will be cut into smaller pieces and cooked relatively quickly, leaner cuts with some marbling work well. Even though filet mignon or ribeye would be a preferred choice, sirloin steak is a good compromise to provide a juicy, beefy flavor, while making a smaller dent in the wallet. Look for top sirloin because it’s high in protein, low in fat which prevents flare-ups on the grill, and has the bones and tougher sections of the muscle removed. Trim off any excess connective tissue when preparing the skewers and they will be great for grilling. To infuse additional flavors on the surface of the steak, the cut pieces of meat are marinated in a mixture of soy sauce, rice wine vinegar, mirin, honey, ginger, and garlic. Not only does it help the flavors of the sauce adhere better to the meat, the salt in the soy sauce acts as a light brine to help the meat retain moisture and become even more tender after cooking. Only a portion of the teriyaki sauce is used for the marinade. The remainder is mixed with a cornstarch slurry which acts as a thickening agent, to help add body. This helps the sauce stick to the beef when drizzled on right before serving. 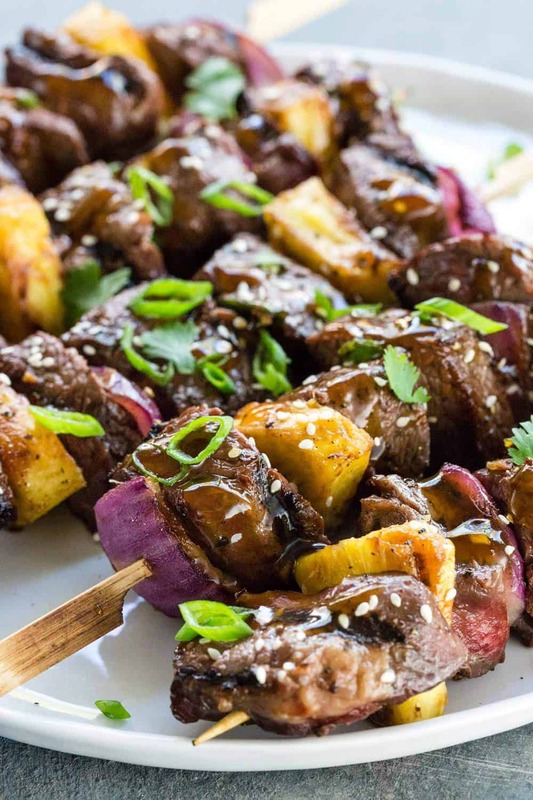 To complement the flavor of the teriyaki beef, red onion and fresh pineapple are threaded onto the skewer. Try skipping the canned stuff and learn how to cut a pineapple, it’s a lot easier than you think! Once you cut off the crown and prickly outer skin, a sweet and tangy golden flesh is revealed. The pineapple becomes caramelized on the hot grill, making it irresistible! 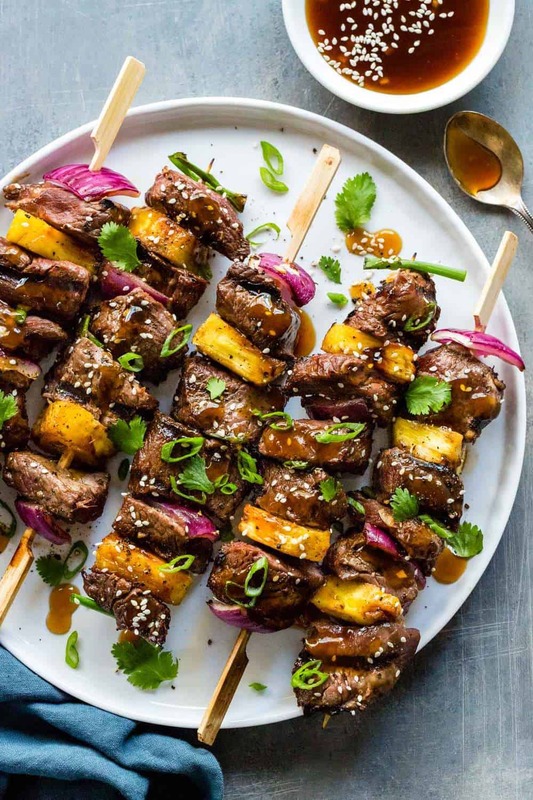 These teriyaki beef skewers will disappear quickly when they’re hot off the grill! Serving them with a potato salad, coleslaw, or roasted cauliflower steaks for a low carb option makes for a satisfying and complete meal. Enjoy! Tender pieces of sirloin steak marinated in an Asian-inspired sauce and cooked on a hot grill. In a medium-sized bowl whisk together soy sauce, ¾ cup water, honey, rice vinegar, mirin rice wine, sesame oil, ginger, and garlic. In a resealable plastic bag and cubed beef and ½ cup of the reserved teriyaki sauce mixture. 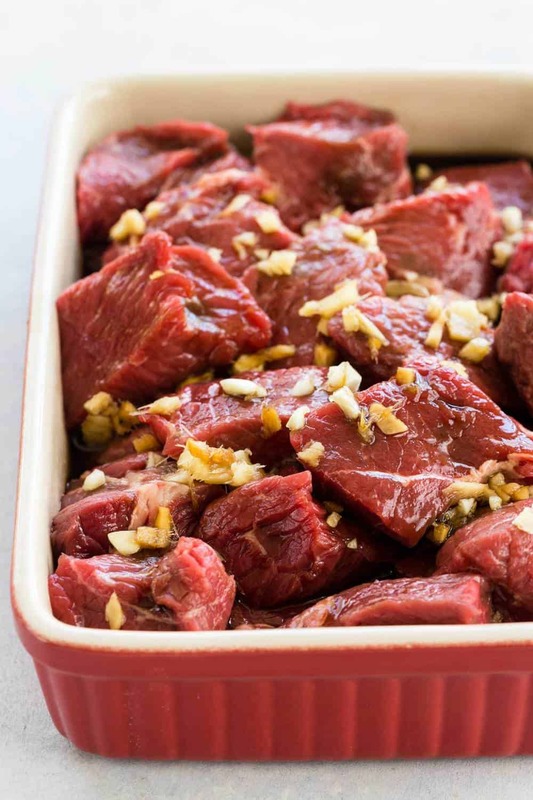 Marinate the beef for at least 30 minutes or overnight in a refrigerator. 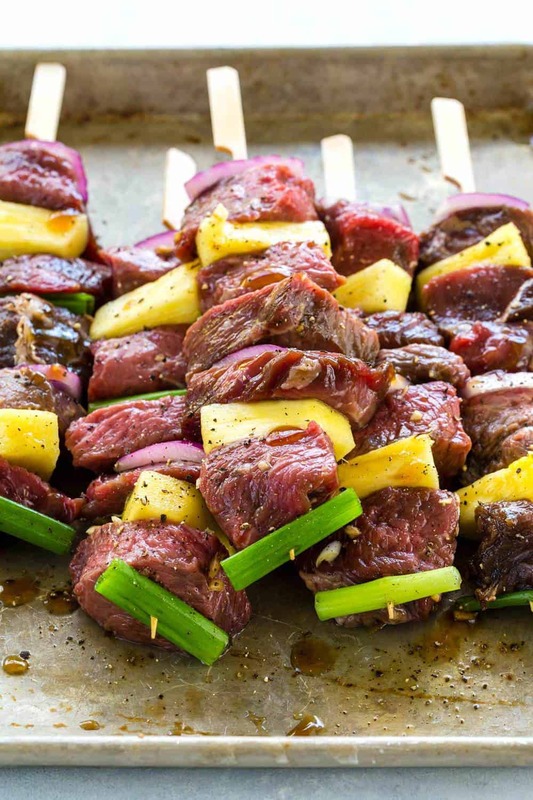 Thread marinated beef, pineapple wedges and red onion on skewers. Heat grill to medium-high. Add a small amount of vegetable oil on a folded piece of paper towel, and then carefully grease the grill with the oil. Once the grill is very hot, add the teriyaki beef skewers and discard the marinade. Cook on one side uncovered for 3 minutes. Flip over and cook another 3 minutes. Cook on the remaining sides for 1 minute per side, or until the internal temperature of the beef reaches 130°F for medium-rare, or 140°F for medium. Allow meat to rest for 5 minutes before serving. Glaze skewers with teriyaki sauce and garnish with sesame seeds, green onions, and cilantro leaves. Serve extra teriyaki sauce on the side. Made these last weekend. Easy to make and was delicious! I am gonna try these recipes. I am a pasta love, and I am glad to get the Alfredo saucr recipe.